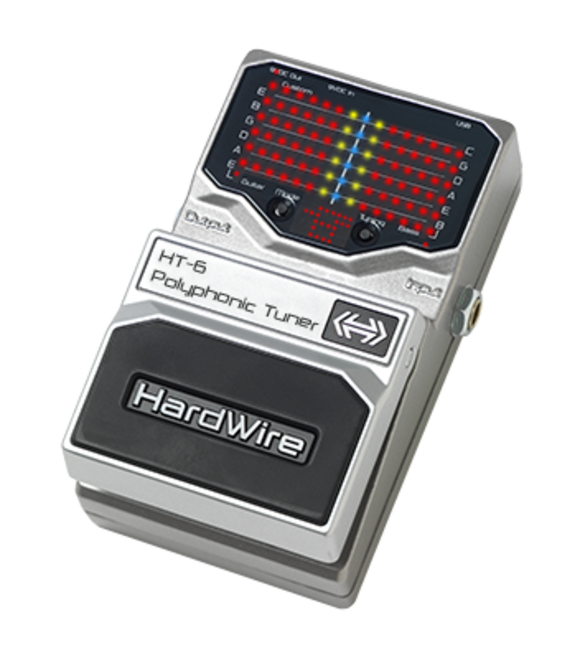 SALT LAKE CITY, Utah -- HardWire, a leading manufacturer of guitar pedals, is now shipping its HT-6 Polyphonic Tuner. The new HT-6 is a tuner for guitarists and bassists that can be used to tune all six strings of an instrument simultaneously. Based on technology from recently acquired 3dB Research, a music technology company with extensive expertise in music and voice processing, the HT-6 makes tuning instruments faster and easier easy by letting the musician simply strum all the strings at once, and view the string display readout to see which strings are in or out of tune. The HT-6 Polyphonic Tuner is a floor pedal that features six rows of LED indicators, one for each string. The LED display matrix represents the six strings of a guitar or the strings of a bass. Two buttons on the HT-6 Tuner's top display panel are used for selecting display modes (Mode) and tuning references (Tuning). The multicolored LEDs provide an easy to see indication of which strings are sharp or flat (red), almost in tune (green) or in tune (blue). The HT-6 also features individual guitar and bass LEDs that indicate whether the Guitar or Bass display mode is being used. The Custom LED will light when the Drop D tuning reference is selected. In addition, the HT-6 displays the name of the individual note as an individual string is tuned. The HT-6 can also be used as a standard single string tuner. The HT-6 is powered by a 9-volt DC battery, or an optional external Harman PS200R DC power adapter. The HT-6 can also power up to six other 9VDC powered pedals on a pedal board when used with an optional DC power adapter and a power chain cable. "The already impressive lineup of HardWire pedals is now even better with the availability of the HT-6 Polyphonic Tuner. We designed the HT-6 with the goal to make tuning easier and faster than ever and users can now take advantage of this great addition to the HardWire family," stated Rob Urry, Vice President and General Manager, Harman Signal Processing. Each HardWire pedal also features an assortment of tour-worthy accessories, including the green gaffer's tape common to pro pedalboards, and a precut hook and loop pad to mount the pedal to a pedalboard. The HT-6 is currently available at an MSRP of $139.95.